Last chance to register to participate live in the 5th Annual CASE Hybrid! 3 days away, you can still register, and join your colleagues in over 33 states so far who will be hosting a Virtual conference. The advantage of the virtual conference is you don't have to make travel arrangements! Most schools and school districts have a room already or easily readied to accommodate a professional learning activity so not much prep there. AND we have an App you can download where all your participants can view the handouts so no need even to have time to copy the handouts — so YES you can still pull off a two day professional learning event for as low at $400! It can be one person sitting at a computer or as many as you choose to have in a room with a computer, LCD, speakers and internet! It might be a little more difficult but you can decide to head South to warmer weather and attend onsite with us at the beautiful Beau Rivage Hotel right on the water in Biloxi, Mississippi! The group rate is over but you can still get a really reasonable rate! And if the dates don't work out for you for either the Virtual or the onsite, then just order the DVD! All registrations are on the CASE website as well as the schedules by each of the time zones: Eastern, Central, Mountain, Pacific, Alaskan and Hawaiian! But time is running out so don't wait another day, register now for the CASE Hybrid. Speaking of time running out... The CEC Early Bird registration ends today — February 8! 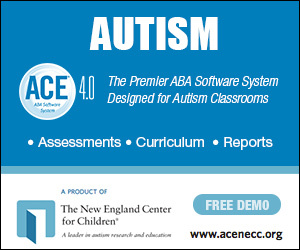 You don't want to miss this great rate for the premier event in all of special education! And as a CASE member, there are some very special CASE events planned for you! Be sure to plan your hotel and arrival so you come in on Tuesday — CASE Member and Board meeting will start with a full breakfast on Wednesday morning sponsored by Winsor Learning! We will have a break sponsored by Houghton Mifflin Harcourt and a highlight of the day is the awards portion sponsored by Master Teacher, On Thursday we will have our showcase session with Julie Weatherly providing 90 Tips in 120 Minutes sponsored by Houghton Mifflin Harcourt. Also, don't forget to purchase your CASE Night tickets for the amazing Grants Farm evening with the Anheuser-Busch world famous Clydesdales sponsored by Star Autism, C8 Sciences and viZzle! So be sure if you haven't registered yet to do so today so you can take advantage of the cheaper rate! Last week's poll celebrated winter... The question was "What is your favorite thing to do in the Winter?" There was a two- way tie for the top selection at 21 percent between read a book and plan a vacation. 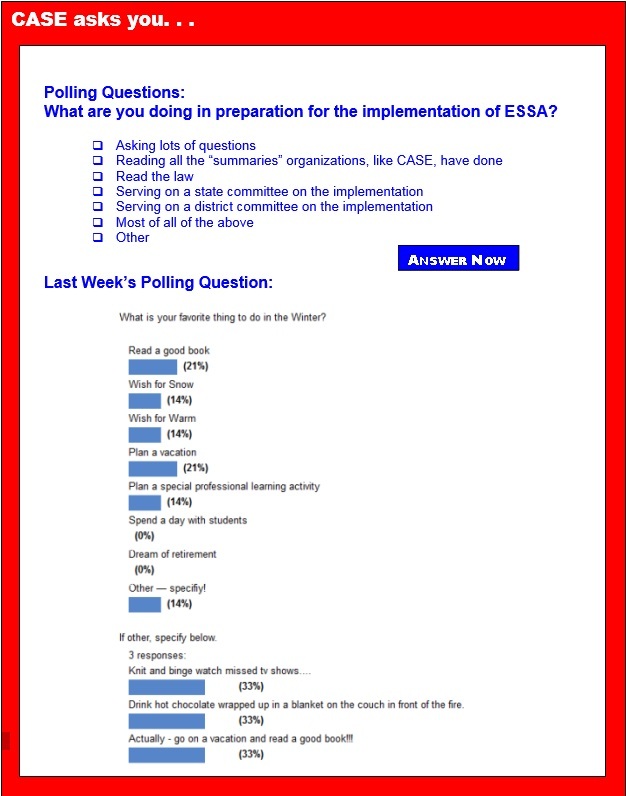 The next category was also a four–way tie but at 14 percent: Wish for snow, wish for warm weather, plan a special professional learning activity — I hope all those whose favorite thing to do is plan a professional learning activity have registered for the CASE Hybrid, if not, now would be a great time to register and last but not least, "other" — which listed such items fun items involving snuggling, drinking and reading and one of my favorites — actually go on a vacation! Enjoy your winter since according to Punxsutawney Phil, spring is right around the corner—yeah, right! 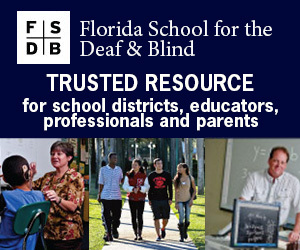 Tell Congress to increase funding for education!